We had a dense talk session on Diablo Canyon Nuclear Power Plant today! Thanks to all who came all the way in this heavy rain! Not only did we talk about Diablo Canyon Nuclear Power Community, we discussed about community energy aggregation system, Fukushima Resolution, and little bit about San Onofre Nuclear Generating Station! Of course the latest victory on Oi reactor as well as a little bit about Hanford Site community who showed us so much solidarity since 2012 to Oi reactor community! We hope that this will bring good people-based “external pressure”, not nation-state-based. We also are interested in hearing what is going on in Japan as well to bring back to our community. So we decided to carry one more talk before Carole leaves Japan. 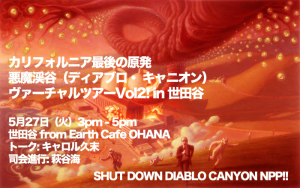 Come to Setagaya from Earth Cafe OHANA on Tuesday afternoon! Carole Hisasue, a journalist, who lives near California’s last nuclear power plant Diablo Canyon Nuclear Power Plant will speaks at Shiroto No Ran (Fudeno Bld. Suite#2, 3-8-12 Koenji Kita Suginami-ku, Tokyo) on her experience in San Luispo, learning about Fukushima from California, and what’s up with Diablo Canyon Nuclear Power Plant. A California-Japan-based interpreter Umi Hagitani will moderate the event!